A signal-in-space (SIS) interface control document (ICD) for the standard positioning service (SPS) of the Indian Regional Navigation Satellite System (IRNSS) is available for download from the Indian Space Research Organization (ISRO) website. The 70-page document addresses the signal modulations, frequency bands, received power levels, data structures and other details of the IRNSS open signal. Dated June 2014, the IRNSS SIS ICD for SPS was recently released to the public to provide essential information on the IRNSS signal-in-space and to facilitate research as well as development and commercial use of the IRNSS signals for navigation-based applications. 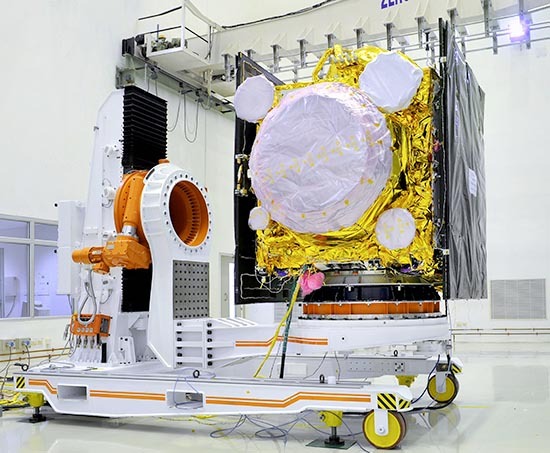 The first satellite (IRNSS-1A) was launched in July 2013 and the second (IRNSS-1B) on April 4, 2014. Another launch is expected this month, with a complete constellation in place by mid-2015, according to ISRO. The system is designed to provide positioning for India region and 1,500 kilometers (930 miles) around the Indian mainland. Seven satellites will eventually comprise the IRNSS space segment: three satellites in geostationary orbits (GSOs) located at 32.5º E, 83º E, and 131.5º E and four satellites in inclined geosynchronous orbits (IGSOs, with two in each plane). The first two satellites that have been launched, both IGSOs, will operate at 55 degrees east longitude with an inclination of 29 degrees with respect to the equator, and have an Earth coverage footprint in a figure 8 north and south of the equator. The other two IGSOs will have their longitude crossing at 111.75º E.
IRNSS will provide two types of navigation services: a standard positioning service (SPS) available to all users and encrypted, restricted services (RS) provided only to authorized users. This payload will operate in the aeronautical radionavigation L5 band (1176.45 MHz) and S-band (2492.028 MHz). Interested persons must register to download the SIS ICD from a dedicated website. The IRNSS website includes a disclaimer that ISRO does not make any assurance regarding the “fitness of the information” furnished in the document, which may be subject to modification and updates, and the agency does not assume any legal liability for any product developed based on the information.